Pretty valentine cards by Essimar, and if you're in Chicago you can meet up with the artist Esther the 12th and 13th at Renegade Handmade during her Valentine-Making Workshop. Cool. These are refreshingly different - I like the fish-scale hearts at the top. They're pretty and cute without being over-the-top sweet. Ever since I first saw these lovely cards, I've been nuts for them! Its a great idea backed up by fantastic craftsmanship! makes me excited for vday! The fish scale ones are adorable! I like 'em. Ohhh these cards are just darling! 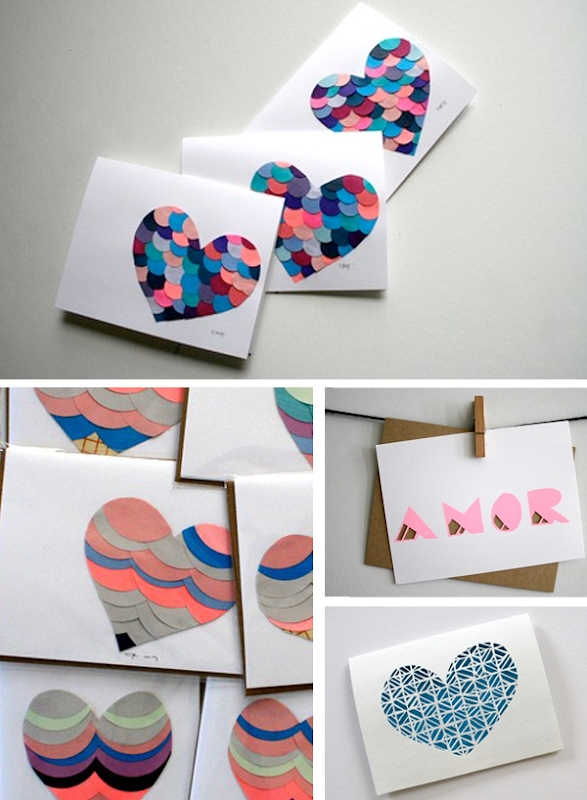 The fish-scale heart one is my favorite! Thanks for the posting, I always make my husband and daughter a homemade Valentine's Day card, great inspirations! The first card reminds me of that book, The Rainbow Fish. These are great! So pretty. I love these and I impressed.